← Galactic Cosmic Rays: You’re Soaking In Them! The global energy outlook is shifting on two fronts: More shale oil & gas production is on tap, and some modest developments on the nuclear front are coming. • Japan will most likely re-start many of their nuclear reactors with improved safety factors over the next few years because Japan has no realistic alternatives. They will remain the third-largest user of uranium in the world. • The current status of U.S. reactors include 100 reactors in full operation, 5 under construction, 25 in the planning/permitting stage, and 32 in permanent shut-down or retirement. • China has 20 operating nuclear power plants (only 1% of their total power produced), another 28 under construction, and has brought 3 nuclear plants on-line in 2013. An additional 50 nuclear plants are in the various stages of planning and permitting. • 2013 U.S. uranium production increased by 16% over that of 2012, the highest production since 1997. At present, 83% of U.S. nuclear fuel demand is met by foreign sources, such as Canada, Australia, and Kazakhstan. • Uranium spot prices will likely remain around $35/lb for yellowcake (U3O8). However, upward cost pressure is growing because of future demands from China, Japan, and new construction. 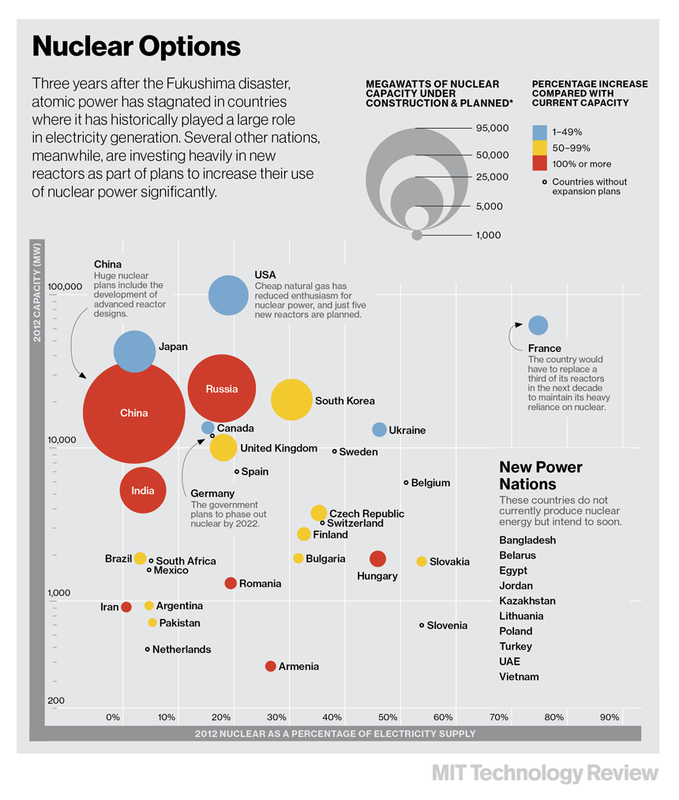 More on prospective thorium reactor development in China, India, and the US. China begins pouring concrete for a demo pebble bed high temperature gas cooled reactor. This year’s losers are likely to include the intermittent unreliables — big wind and big solar — as more governments are forced to cut wasteful subsidies for the expensive and ultimately destructive technologies. As more nations develop their own shale oil & gas resources, current suppliers from Russia to the Middle East are likely to feel the pinch of reduced export income. Russia may have choked Ukrainian access to its rich Eastern shale deposits, but Putin cannot stop China from developing its shale wealth. Some African and Middle Eastern oil producers will likewise see less demand for oil, as other sources of energy are developed elsewhere. It is difficult to predict how all of this will affect global oil prices, particularly as lingering effects from the 2008 – 2009 global recession still hang over the economic landscape like a toxic cloud. In the US, for example, without the shale energy revolution the US would likely still be in recession. In China, continued ghost-bubble stimulus is required to prevent collapse in several industries. Exporting nations such as Russia, Brazil, India, etc. experience slumps along with downward fluctuations in commodities prices. The only type of peak oil we are likely to see in the near to intermediate future is “political peak oil.” In other words, energy shortages that come from bad political decisions by government leaders and bureaucrats — such as Obama’s EPA. Watch them closely. In the deep background, several potentially disruptive energy technologies continue in development. We do not need for all of them to succeed. More: Russia’s global energy intentions . . .
To keep energy prices higher, so the oligarchs who report to the Kremlin can continue to line their pockets. What Russia is doing is neither new, nor unpredictable. Russia’s invasion of Ukraine was not about grabbing Ukraine’s energy wealth. It was all about holding Ukraine back from becoming less dependent upon neo-imperial Russia. Putin and his new gang of oligarchs want to have it all, and to lord it over everyone they can. But the world is changing, outside their grasp. They are very vulnerable to the price of energy. Good news for the world is bad news for Russia. This entry was posted in Energy, Nuclear Power and tagged Nuclear Energy. Bookmark the permalink. Whenever discussing the Ukraine, remember that the crisis began with a US/EU supported coup d’etat that overthrew the legitimate, freely and democratically elected government of Yanukovych and his party. A junta now sits in Kiev. It has little support in the East and Crimea, which voted heavily for Yanukovych (60 to 90%), and might have only a bare majority support in the West. Russia has merely exploited an unexpected opportunity that would not have existed had not the US/EU intervened in Ukraine to achieve their own economic goal, which was the integration of Ukraine into the EU and NATO. Plainly, the US/EU shot themselves in the head. The bad guys fought the bad guys, and the bad guys won. Who woulda thunk it? Yes, there are no good guys on the front lines. Sometimes, that truism becomes a red herring. Your narrative of events in Ukraine is nice, neat, easy to remember. Easy to believe. Strong belief in things one did not witness, however, is not recommended. Arguing over beliefs in things one did not witness is particularly discouraged. I suggest this: Russia has been preparing for the Crimea coup for years, as well as what comes after. How far Russia moves into East Ukraine will depend upon many things happening inside and outside Russia’s putative borders. This thing is far from over. They have no interest in Ukraine other than money? What if China took over the governments of Mexico and Canada and started military exercises there. Would the US only have interest in their money? If Quebec rebelled against this and had an election that separated them from the rest of Canada would the US support them? You know the answer to this. Why do you hate the Russians so much? If you don’t you give the appearance of hating them.